Apparently, parrots aren’t just smart, they’re competitive too. A couple of months ago, we covered recent research findings on contagious yawning in animals, reporting on the rarity of the phenomenon and its potential role as a form of social mimicry or even an indication of empathy. While certain primates clearly do yawn contagiously and dogs may yawn contagiously, the behavior hadn’t been reported in other animals and had been expressly ruled out in red-footed tortoises (although the tortoises may have had the last laugh, as they won the celebrated Ig Nobel Prize for their non-yawns). Word of our mammal-centric coverage seems to have reached the small, oval ears of the always-influential parrot lobby, though, as just last week the journal Behavioural Processes published a study describing social yawning in budgerigars (Melopsittacus undulatus), the small Australian parrot often referred to as the parakeet. This study provides the first support for contagious yawning in a non-mammal, and even ups the ante by documenting what may be the first instance of contagious stretching, another stereotyped behavior that may play a social role for certain animals. Some may say that the paper’s timing is an utter coincidence and that only someone with delusions of grandeur would believe that it was even remotely linked to the AnimalWise post. We, speaking in our usual royal manner, prefer to think otherwise. Michael Miller, Andrew Gallup and other researchers from the University of the Binghamton conducted an observational study of yawning and stretching in a group of approximately 20 adult male and female budgerigars living together in an aviary as an established flock. Over a period of about a year and a half, the research team video recorded the flock on 23 separate occasions. The recording sessions, each of which lasted 90 minutes, were conducted at varying times of the day, and the researchers took a number of precautions (such as ignoring the first 15 minutes of each tape) to ensure that the flock’s behavior was as natural and undisturbed as possible. Trained reviewers then systematically reviewed all of the tapes, recording the time and occurrence of each yawn and stretch, and categorizing each stretch by whether the bird extended one or both legs. The researchers’ hypothesis was that, if yawning and stretching were spreading contagiously among the birds, the behaviors would occur in nonrandom “clumps” – that is, rather than being evenly dispersed throughout the recording sessions, multiple yawns (or multiple stretches of the same type) would take place in closely-spaced bouts and then be followed by a long interval until a new priming behavior triggered another bout. 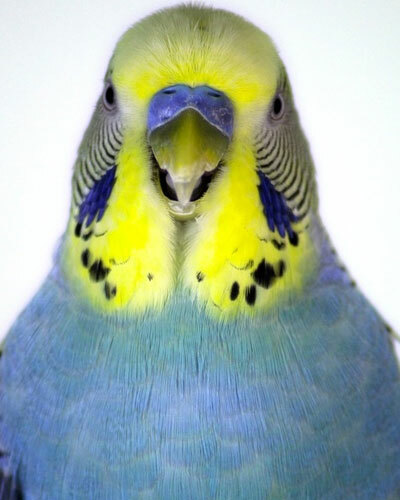 Further, they predicted that, although there might be might be overall tendencies tied to particular times of the day (for example, the budgerigars might, on average, yawn more frequently during evening sessions), if the yawning and stretching really were being triggered contagiously, then specific clumping patterns would not repeat themselves when multiple same-time-of-day sessions were compared. To test their hypotheses, the researchers performed detailed, session-by-session analyses of each type of behavior. For example, they tallied how frequently each behavior occurred, measured the time between adjacent stretches and yawns, and sorted the adjacent pairs into different “bins” depending on the length of the interval. They also analyzed each session for clumping by breaking it down into a large number of short (20 to 30 second) intervals, which allowed them to identify “runs” of consecutive intervals that either did, or did not, contain the behavior in question. Finally, they statistically analyzed their data in a variety of ways to identify patterns and associations. The observational results presented here suggest that yawning and stretching are at least mildly contagious in budgerigars under semi-natural flock-living conditions. In line with each behavior’s presumed physiological function, contagious yawning and stretching may ultimately coordinate mental state and a group’s collective movements, but future research needs to test these predictions. So, kudos to the budgerigars! Parrots everywhere can take pride in these findings, which point to previously-unknown areas of avian social signaling and coordination, and which may open up new avenues for studying collective behavior. Miller, M., Gallup, A., Vogel, A., Vicario, S., & Clark, A. (2011). Evidence for contagious behaviors in budgerigars (Melopsittacus undulatus): An observational study of yawning and stretching Behavioural Processes DOI: 10.1016/j.beproc.2011.12.012. 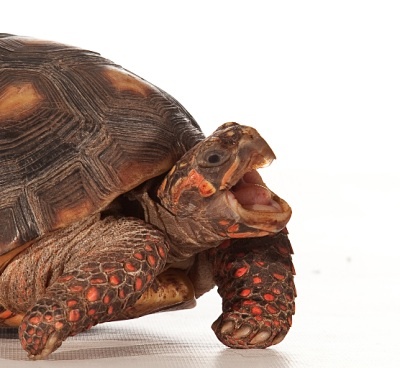 A group of red-footed tortoises ran away (rather slowly) with the 2011 Ig Nobel Prize in physiology1, bringing to center stage the potential link between contagious yawning and empathy in animals. While the Ig Nobels are a tongue-in-cheek spoof of the Nobel Prizes, their purpose is not frivolous – they “honor achievements that first make people laugh, and then make them think. The prizes are intended to celebrate the unusual, honor the imaginative — and spur people’s interest in science, medicine, and technology.” Here’s the story of the tortoises’ claim to fame and what we know about contagious yawning in animals. Tortoise yawning? I don’t think so! It turns out that the underlying cause of contagious yawning has been something of a puzzle – why is it that when you see someone else yawn (or even hear a yawn or just think about yawning), you sometimes are overcome with the urge to yawn yourself? The most common hypotheses are that contagious yawning results either from empathy or from non-conscious social mimicry, the tendency to adopt a social partner’s postures, gestures and mannerisms. An alternative hypothesis, however, is that it may simply reflect a fixed action pattern, an innate or instinctual response to a stimulus (a triggering yawn). And that’s where the red-footed tortoises lumber into the picture. Lead researcher Anna Wilkinson and her colleagues figured the tortoises would offer a good way of testing the fixed action pattern hypothesis, since they are known to yawn and respond to social stimuli, but are not believed to exhibit empathy or engage in non-conscious social mimicry. The researchers worked very hard to induce contagious tortoise yawning, spending six months training one of them (Alexander, if you’re curious) to yawn whenever he saw a red square-shaped symbol, and then devising a series of tests to see whether six “observer” tortoises would yawn after seeing Alexander yawn. Initially, the observers were presented with three scenarios: one in which they watched Alexander giving one of his patented yawns, another in which they watched a non-yawning tortoise (Alexander? ), and a third in which they simply viewed Alexander’s red square. A second experiment mirrored the first, except this time the observers watched Alexander yawn multiple times. Finally, they went to the movies, seeing clips of real tortoise yawns, fake yawns and an empty background. And the results? Nothing, nada, zilch. The tortoises simply didn’t yawn more frequently after seeing another tortoise yawn; no contagious yawning whatsoever. This spectacular display of non-yawning in tortoises led the researchers to “suggest that contagious yawning is not simply the result of a fixed action pattern and releaser stimulus …. We suggest that contagious yawning may be controlled through social processes such as nonconscious mimicry or empathy….” Naturally, international acclaim ensued. Apes and Monkeys and Dogs, Oh My! So, which animals do demonstrate contagious yawning? Well, as with other cognitive realms, our views of contagious yawning have followed “AnimalWise’s Rule”: first we believed it to be an exclusively human behavior, then we observed it in chimpanzees, then we saw it in monkeys, next in dogs, now … hmm … Taste it, fur-face, I have opposable thumbs! Ok, I lied, that’s not a real rule; I just made it up. The phenomenon was first demonstrated in chimpanzees in 2004 when a research team led by James Anderson of the University of Stirling reported2 on a small study in which six adult female chimps watched video scenes of other chimps who were either yawning naturally or, alternatively, displaying open-mouthed facial expressions that weren’t yawns. Two of the observers (33%) yawned significantly more often in response to the yawn videos and none of them yawned more frequently in response to the open-mouth control videos, a response rate only slightly lower than that in humans watching comparable videos. In 2009, Matthew Campbell and colleagues from the Yerkes National Primate Research Center (YNPRC) expanded on these findings, reporting3 that, much like humans responding to on-screen yawns by Pixar characters, a group of 24 chimps yawned significantly more often after watching 3D computer animations of yawning chimps than after watching animations of chimps displaying non-yawn mouth movements. Finally, Matthew Campbell and Frans de Waal of the YNPRC reported4 this year on an experiment lending empirical support to the hypothesis that contagious yawning stems from empathy. Campbell and de Waal found that, consistent with studies showing that humans demonstrate greater empathy towards others they view as being similar, chimps yawned significantly more frequently in response to videos of familiar chimps yawning than they did to either videos of unfamiliar chimps yawning or videos of chimps (regardless of familiarity) who were at rest. The first study supporting contagious yawning in non-ape primates was published5 in 2006 by University of Stirling researchers Annika Paukner and James Anderson, who had 22 stumptail macaques watch video clips of other macaques either yawning or making non-yawn facial movements. Although the macaques yawned significantly more in response to yawn tapes than to non-yawn tapes, the researchers noted that the macaques engaged in more self-directed scratching (a tension-relieving behavior) while watching the yawn tapes, making it difficult to differentiate between actual contagious yawning and the release of stress perhaps brought on by the yawn tapes. The case for non-hominid contagious yawning was bolstered in 2009, though, when Elisabetta Palagi of Pisa University and her colleagues published6 a study in which they recorded and reviewed over 3,200 baboon yawning displays (all occurring in the absence of stressful events or behavior). They not only found clear evidence of contagious yawning among adult baboons, but also discovered that females (but not males) tended to match the type of yawning display (baboons make different facial expressions when yawning) that had triggered their own yawn, and that the degree of contagiousness correlated with social closeness, thus supporting an empathy-basis for yawn contagion and anticipating the results of 2011 chimpanzee experiment described above. Lastly, in 2008 Ramiro Joly-Macheroni and colleagues from the University of London reported7 on an experimental first on multiple fronts: yawn contagion in a non-primate species and the first demonstration of possible contagious yawning across different species. In their study, 29 dogs observed an unfamiliar human either yawning or making non-yawning mouth movements, with 21 dogs yawning in response to the yawning human and not one yawning in response to the human who displayed the non-yawning control behavior. 1Wilkinson, A., Sebanz, N., Mandl, I., & Huber, L. (2011). No evidence of contagious yawning in the red-footed tortoise Geochelone carbonaria. Current Zoology, 57(4), 477-484. 2Anderson, J., Myowa-Yamakoshi, M., & Matsuzawa, T. (2004). Contagious yawning in chimpanzees Proceedings of the Royal Society B: Biological Sciences, 271 (Suppl_6) DOI: 10.1098/rsbl.2004.0224. 3Campbell, M., Carter, J., Proctor, D., Eisenberg, M., & de Waal, F. (2009). Computer animations stimulate contagious yawning in chimpanzees Proceedings of the Royal Society B: Biological Sciences, 276 (1676), 4255-4259 DOI: 10.1098/rspb.2009.1087. 4Campbell, M., & de Waal, F. (2011). Ingroup-Outgroup Bias in Contagious Yawning by Chimpanzees Supports Link to Empathy PLoS ONE, 6 (4) DOI: 10.1371/journal.pone.0018283. 5Paukner, A., & Anderson, J. (2006). Video-induced yawning in stumptail macaques (Macaca arctoides) Biology Letters, 2 (1), 36-38 DOI: 10.1098/rsbl.2005.0411. 6Palagi, E., Leone, A., Mancini, G., & Ferrari, P. (2009). Contagious yawning in gelada baboons as a possible expression of empathy Proceedings of the National Academy of Sciences, 106 (46), 19262-19267 DOI: 10.1073/pnas.0910891106. 7Joly-Mascheroni, R., Senju, A., & Shepherd, A. (2008). Dogs catch human yawns Biology Letters, 4 (5), 446-448 DOI: 10.1098/rsbl.2008.0333. Receive notice of new AnimalWise posts by email.